Cards and Crafts projects are ideal for all ages and abilities. They are particularly well suited for Nurseries and Cheders, as they enable young people to express their creativity to benefit others. Cards and Crafts is not only a great intergenerational project, but also a fantastic interfaith project, as young people from all communities and backgrounds can join together to create cards, art and other gifts for members of their local community, and beyond. From making birthday cards for hospital patients, care home residents and refuge shelters, crafting scarves and hats for the homeless or reusing and re-purposing old items, there are so many ways to get creative for others! Find a local cause to donate your craft items to, and confirm what type of hand made items they would welcome. Don’t forget to discuss transportation/delivery. Make sure that you have a suitable craft preparation area organised and correct equipment. Crafting can get messy, so do remember to cover tables and work tops. Do check that you have organised any relevant insurance and checked any health and safety requirements. Contact local shops and shops to ask them to donate equipment or ask each of your volunteers to bring in designated items. Mitzvah Day’s Available Projects page lists some of the charities that would welcome your contribution. Organise a team of helpers to make sure that you have all the resources that will be needed.Make sure to bring rubbish bags with you. Don’t forget to check that a first aid kit is available. Designate some key people to oversee the project and to be on hand to help out. Plan timings for the event and organise when and how the finished items will be delivered to the charity. Nominate a team member to take photos. Make sure that all your team members arrive on time wearing Mitzvah Day Merchandise, and are aware of what needs to be done. It’s also great to let your volunteers know who they are making items for and why! Check that you have the contact details for the recipients. After the project, please ensure that all waste is disposed of appropriately and that the site is cleared. Thank your volunteers, the charity and any donors and encourage them to get involved in the future with craft projects. 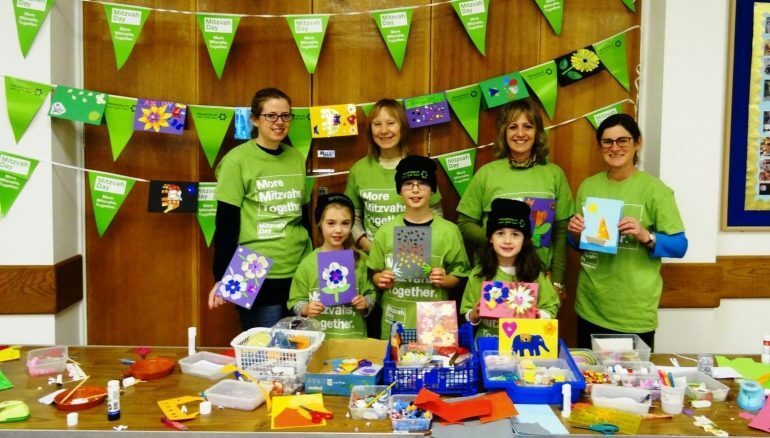 Send Mitzvah Day some before, during and after photos and let us know about your successful Mitzvah Day “Cards and Crafts” Project!